We've been considering the possibility of moving out of the Bay Area to somewhere less crowded, somewhere in the desert southwest we so love to visit. But that also means moving to somewhere with much harsher weather. How harsh? It's pretty easy to search for a specific location and get average temperatures. But what if I want to make a table to compare several different locations? I couldn't find any site that made that easy. No problem, I say. Surely there's a Python library, I say. Well, no, as it turns out. There are Python APIs to get the current weather anywhere; but if you want historical weather data, or weather data averaged over many years, you're out of luck. NOAA purports to have historical climate data, but the only dataset I found was spotty and hard to use. There's an FTP site containing directories by year; inside are gzipped files with names like 723710-03162-2012.op.gz. The first two numbers are station numbers, and there's a file at the top level called ish-history.txt with a list of the station codes and corresponding numbers. Not obvious! Each line represents one day (20120101 is January 1st, 2012), and the codes are explained in another file called GSOD_DESC.txt. For instance, MAX is the daily high temperature, and SNDP is snow depth. So all I needed was to decode the station names, download the right files and parse them. 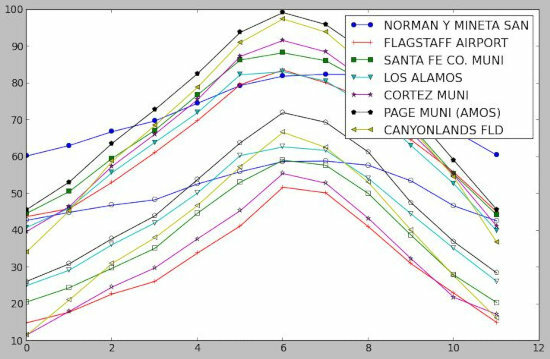 That took about a day to write (including a lot of time wasted futzing with mysterious incantations for matplotlib). Back to the data -- it turns out NOAA doesn't actually have that much historical data available for download. If you search on most of these locations, you'll find sites that claim to have historical temperatures dating back 50 years or more, sometimes back to the 1800s. But NOAA typically only has files starting at about 2005 or 2006. I don't know where sites are getting this older data, or how reliable it is. Still, averages since 2006 are still interesting to compare. Here's a run of noaatemps.py KSJC KFLG KSAF KLAM KCEZ KPGA KCNY. It's striking how moderate California weather is compared to any of these inland sites. No surprise there. 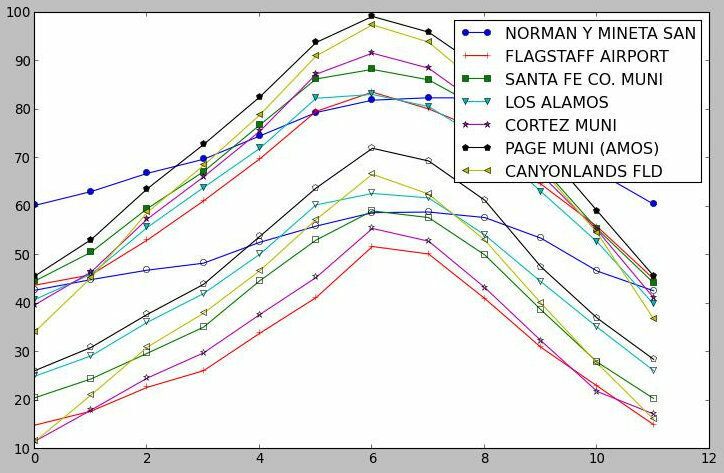 Another surprise was that Los Alamos, despite its high elevation, has more moderate weather than most of the others -- lower highs, higher lows. I was a bit disappointed at how sparse the site list was -- no site in Moab? Really? So I used Canyonlands Field instead. Anyway, it's fun for a data junkie to play around with, and it prints data on other weather factors, like precipitation and snowpack, although it doesn't plot them yet. The code is on my GitHub scripts page, under Weather. Anyone found a better source for historical weather information? I'd love to have something that went back far enough to do some climate research, see what sites are getting warmer, colder, or seeing greater or lesser spreads between their extreme temperatures. The NOAA dataset obviously can't do that, so there must be something else that weather researchers use. Data on other countries would be interesting, too. Is there anything that's available to the public?